Scientists were astonished to find a beautifully preserved skeleton from what appears to be a young T-rex. Scientists have made an absolutely astonishing discovery in Montana after finding an almost totally intact skeleton of a young Tyrannosaurus Rex that died 66.5 million years ago, or shortly before dinos went extinct. 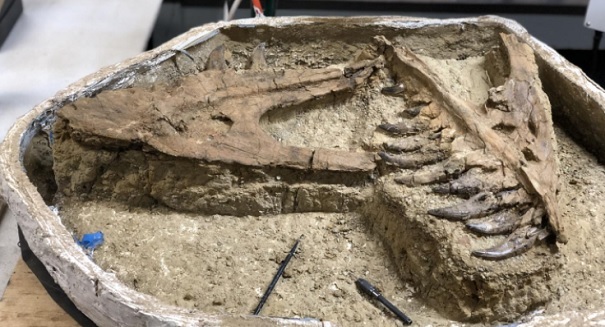 The find was made in the summer of 2016 in Hell Creek, but scientists were not sure what they had found until they came back later and found its skull that confirmed a tyrannosaur. The findings were announce dthis past week, and researchers are calling it a “one in 100 million specimen.” Scientists have had a hard time finding specimens of young T-rexs, and there has been a lot of debate in the scientific community in the past when someone claims to have found a juvenile specimen. This appears to be the real deal, however, and it would be only the third such specimen and perhaps the best preserved one. The specimen is about 17 feet long, and the T-rex in question was probably about seven years old when it died. There is a chance that the skeleton could belong to a fully grown Nanotyrannus instead, and scientists are currently looking into that possibility as well.